Republicans are hammering on a sore spot in the Obama economy: part-time jobs. Over 6.6 million Americans work part-time jobs but want full-time jobs. That's much higher than the roughly 4.5 million part-timers before the Great Recession began. These so-called "involuntary part-time workers" have become ammo for Republicans to fire at Obama's economic recovery. "So look at what's happened, what this president has done to our economy. We've had a huge shift from full-time work to part-time work," New Jersey Gov. Chris Christie, a likely presidential candidate, said in New Hampshire in May. Republican presidential candidates Rick Perry and Ted Cruz have made similar comments. But is the part-time problem as bad as Christie makes it sound? The numbers say no. The problem started before Obama: Part-time jobs actually starting sprouting up during President George W. Bush's term. In Bush's last year, involuntary part-time jobs shot up from 4.8 million to 8 million. So the argument that the part-time problem started under Obama isn't true. Furthermore, while the number of involuntary part-time workers is still high, their ranks peaked in 2010 and have declined since. There is improvement, albeit slowly. Here's the context on America's current part-time problem. Will it get better? The reason that leaders should worry is that part-time workers tend to be paid less per hour than full-time workers, even if they do the exact same jobs. Part-timers are also far more likely to live in poverty and receive no benefits such as paid sick leave or health care. 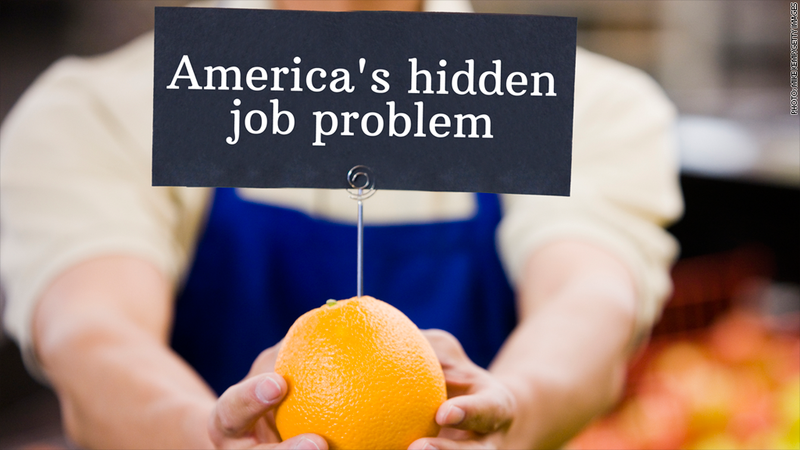 Some economists describe involuntary part-time work as "hidden unemployment." The debate now is whether America will ever be able to get more people back into full-time jobs who want them. The San Francisco Federal Reserve added to the fire Monday, publishing a sobering look at part-time workers. The study warns that the prevalence of involuntary part-time workers might not be entirely due to the recession. Involuntary part-time work "could be intensified" by the Affordable Care Act, President Obama's policy crown jewel. Many big box stores, like Walmart (WMT) and Home Depot (HD), announced last year they would cut health insurance for several thousand part-time workers. Higher minimum wages may also be playing a role. Employers in the states with high minimum wages -- another Democrat initiative -- tend to rely more on part-time workers, according to the Fed report. 1. The number of involuntary part-time workers is down from 9.2 million in 2010 to 6.6 million today. 2. These workers have made up 4.7% of all employed people over the last 12 months. That's below the average of the last five years -- 5.5%. 3. The ACA mandate that Republicans said would increase part-time jobs has not had a major impact so far. The involuntary worker population is actually down slightly from where it was when the mandate began in January. 4. The San Francisco Fed points out that many factors affecting part-time workers are temporary, meaning the numbers should go down more in the coming months. Millions of Americans are stuck in part-time jobs when they want full-time work. It's one part of the economy that hasn't rebounded enough, although presidential candidates need to have the full context.